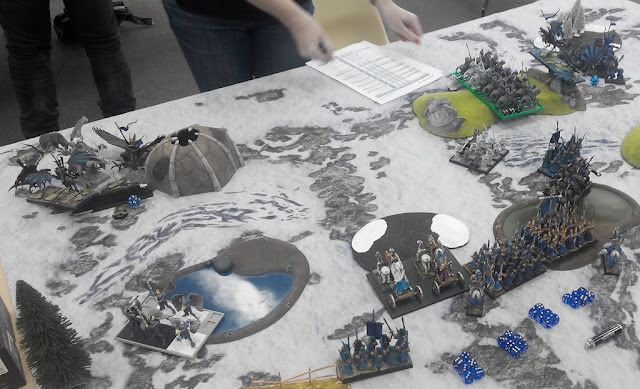 In the third game of the tournament I had a pleasure to play against Kate and her Forces of Basilea army. It was the first time I played against Kate. 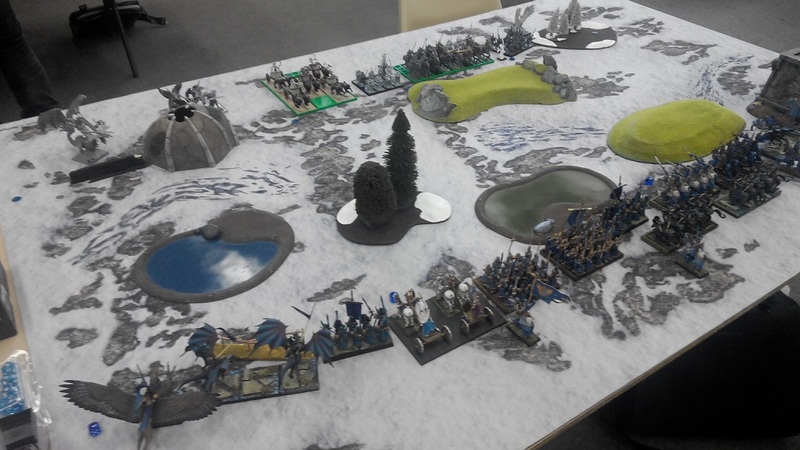 I must add that it is really great to know that there are so many Kings of War players in Canberra as I happen to meet new people every time I attend a tournament! Forces of Basilea is also quite an unique army and I am surprised that such a classic force for Mantic world does is not represented more often. What is more, Kate did a great job in terms of collecting fantastic Mantic models and I am sure her army will look fantastic when she finishes painting it. Hopefully, she will be attending the tournaments regularly too! The army she assembled for the tournament had all the fantastic units that are trademarks for the Forces of Basilea, here is the list with the details. 20 Paladin Knights - it is not often that I can have a chance to see a horde of Knights. It is truly formidable sight and it is one of the most powerful units in the game. To make sure their big size is not going to be a huge disadvantage, they came equipped with Pathfinder upgrade. 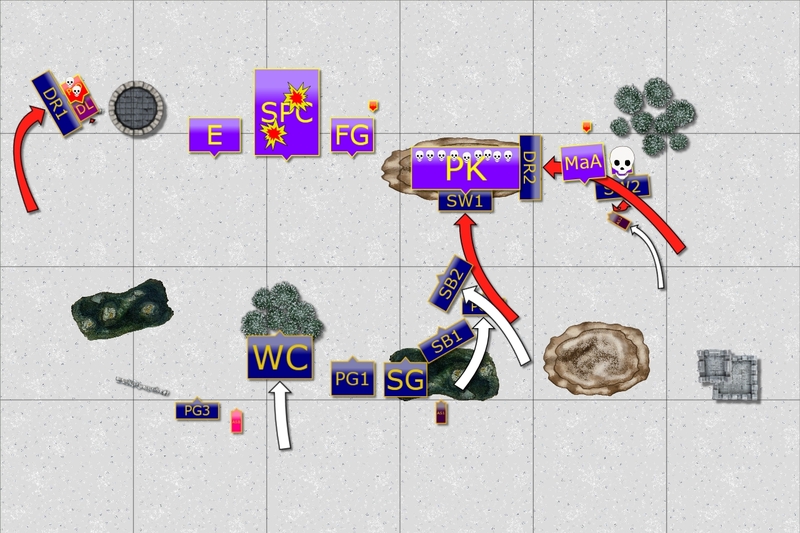 And with 32 Attacks hitting on 3+ even Sea Guard with its Phalanx may die in a single turn of melee. The chance to take down such a powerful unit would be in the fact it has broad front so that many of my units may attack it while it can counter charge only one of them. That may potentially allow to get some flank charges in the following turns. I did not even dream of defeating this unit in one go and I knew there would be price to pay to achieve that. 6 Sisterhood Panther Chariots - another classic unit for Forces of Basilea. The chariots are very fast so my own cavalry cannot outpace them. They have huge amount of attacks too and with Brew of Sharpness they hit as well as the Knights. In fact, since they also have Vicious special rule I would expect them to do more damage than the Knights if their target is caught in the open. The chariots, however, are more fragile as they have lower nerve and armor. Hence, I decided to try and focus my ranged attacks on them so that I can at least damage them before inevitable melee. 20 Foot Guard - The regiment of Foot Guard came equipped with two-handed weapons for more damage in melee. They got additional upgrade for CS(2) in total so with 3+ to hit they will be very consistent in dealing damage for sure. Definitely a dangerous unit but since they are infantry I thought I would need to deal with some faster elements first anyway before they would get into position to threaten my units. Still, a unit not to be ignored! 20 Men-at-Arms - all these super powerful units around make humble Men-at-Arms look like an odd element in the army but I would never underestimate them. First, Phalanx is still quite useful and they can take a charge of any of my unit and pin it down. Much more defensive in their nature, they still have important roles to play, even if these are not as glorious as for other, more shiny elements of the army. High Paladin on Dragon - High Paladin is the main contender for the most dangerous element of the Basilean army category. In addition to the usual advantages of a dragon it has Heal(2) which can help other units, in particular that entire army comes equipped with Iron Resolve. 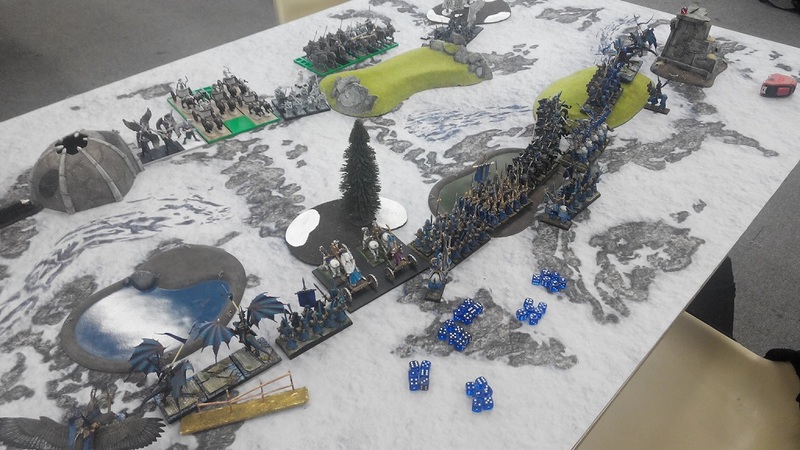 However, against the Dragon alone I was willing to risk sending my faster Drakon Lord as the counter charge would not necessarily rout him immediately and every turn the Dragon is not flying around, breathing fire or getting to the position to flank/charge is a huge bonus for me. Phoenix - Phoenix is a fantastic support, either to keep healing the units or to catch the stragglers and finish them with Breath Attacks. May be difficult to rout because of fantastic Regenerate 4+ ability. However, with Defense 3+ it is quite fragile so a dedicated turn of shooting may bring it down. I would not count on such an opportunity but it is good to have that in mind just in case. 2 x War Wizard - War Wizards bring some more flexibility for the army in the form of ranged attacks. They may not be useful early in the game but once the enemy starts taking damage they will be very helpful. Just in case there is no way to use Fireballs they come equipped with Soul Drain. It has a fantastic potential to further weaken the enemy units while at the same time healing their own. In general I was about to fight against the army with air superiority as a combined might of High Palading on Dragon, Elohi and Phoenix was much more dangerous and flexible than my Drakons. Forces of Basilea had a great speed as an advantage too. In addition, it was the force that would comfortable take frontal charges and easily rout any single unit of my own in a frontal assault too. However, it had 9 elements vs my 15 and I was looking for a chance in that department. 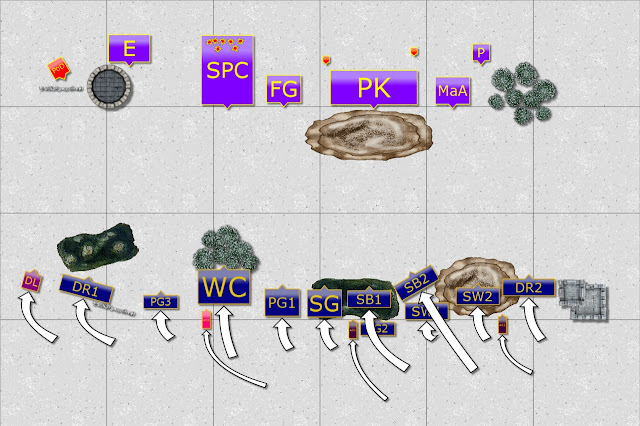 First, I had a bit of an insight in the formation the opponent army was to start with. 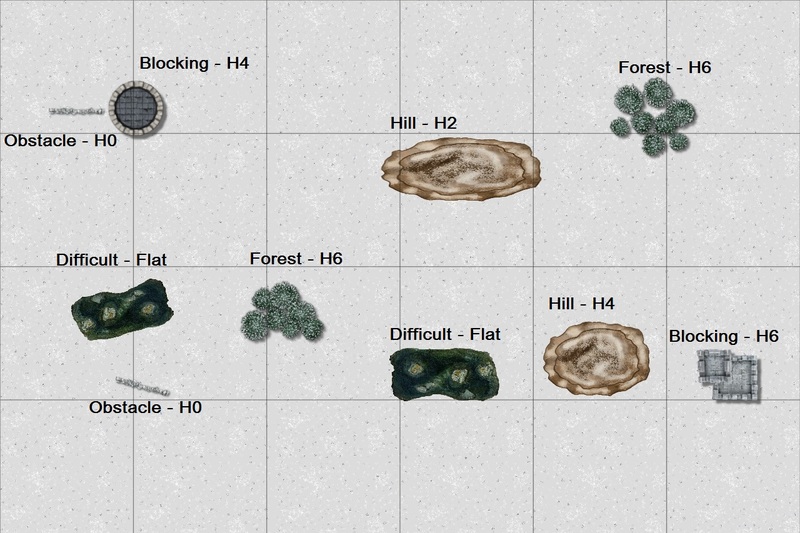 Second, it allowed me to better position my units to be able to choose melees accordingly. I also wanted to use my ranged attacks to inflict some damage on the chariots so that I could hopefully eliminate them before they charge too many of my units. We played Dominate as a scenario and that created quite an interesting situation. On one hand it forces players to put some strong units in the center to park in the middle and claim objective of the scenario. Forces of Basilea came well equipped for that purpose. 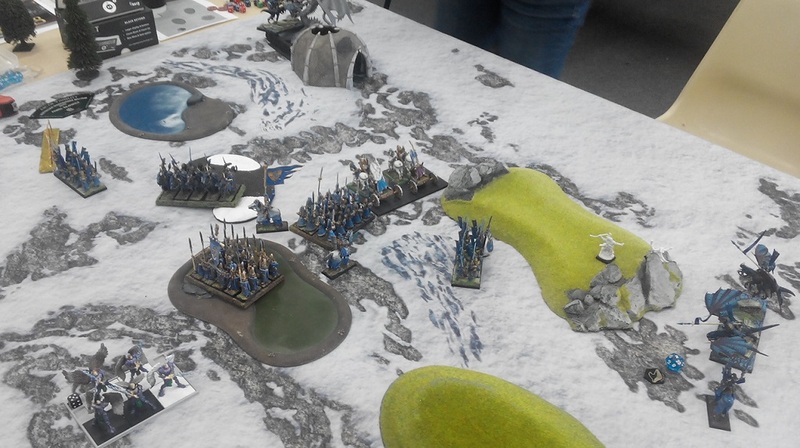 On the other, moving units to the middle opens them for flank attacks, something Elves wanted to achieve. If Forces of Basilea would be able to break the center of Elven formation before being outflanked then they would most likely claim the victory. 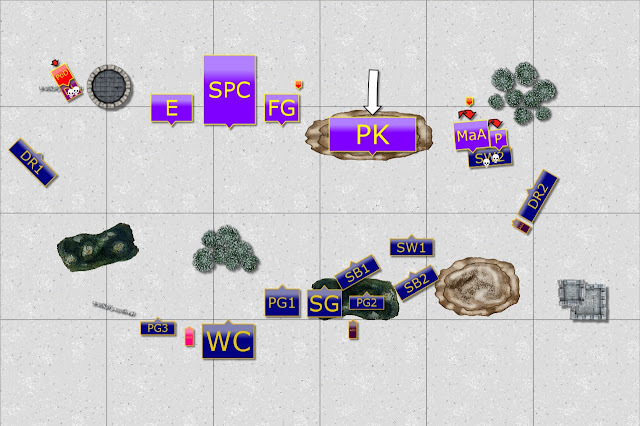 But if Elven center would hold long enough for the flankers to get into position for combined charges then they may have a chance to control the center in the end. Looking at the deployment I also decided that it would be difficult to win left flank but if I could slow down the Dragon at least that would be of a great help for the rest of the army. I also needed to overwhelm the right flank so I decided to team up heavy cavalry and drakons for potential frontal charge against the Knights. I thought I may have a chance to win against them and was willing to lose 1-2 units to bring them down. I won the roll off for the first turn and chose to go first to start shooting at the chariots before they moved. Elves tried to seize the initiative by moving towards the enemy but the approach was careful so that none of the elements moved too close to be intercepted by Forces of Basilea. All the shooters moved to the positions and aimed at the Chariots inflicting some damage. Surprisingly for Elven commanders Forces of Basilea did not approach at speed. What is more, some of the more powerful elements remained stationary. It looked like the Basileans were concerned about the safety of their flanks. The opportunities for intercepting enemy fliers presented themselves and Elves charged to begin the fight for air superiority. On the left flank swift Drakon Lord attacked High Paladin and while didn't do much damage, the supreme general of the Basilean army was now pinned down. Drakon Riders were hurrying to support their commander before Elohi could intercept them. 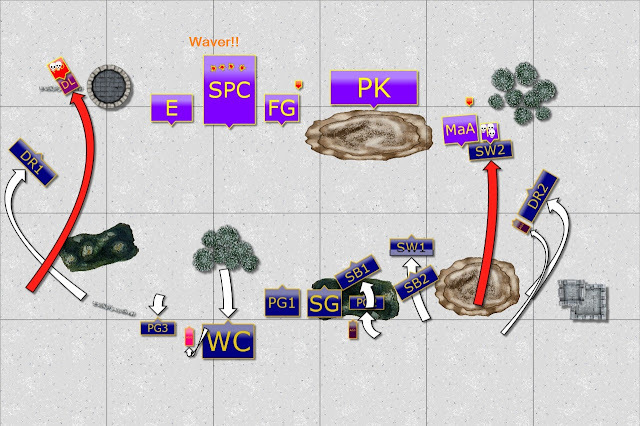 On the opposite flank Storm Wind cavalry charged the Phoenix who landed a bit too close to the enemy and she too was grounded. 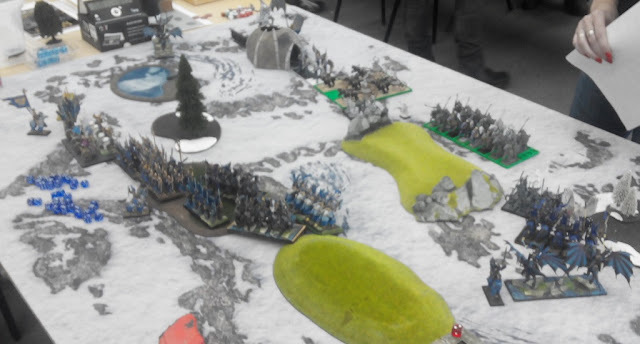 Last but not least, Elven fast cavalry and Sea Guard kept shooting at the Chariots and managed to waver the unit! The Knights take the hill. Basileans still do not close the distance. The units on both flanks counter charged but Elves held. The Knights moved on the hill but other units remained stationary or moved very little in order to protect the Chariots. Drakon Riders on both flanks attack! On the left they aid the Drakon Lord and aerial combat against High Paladin on Dragon continues. The beast is wounded but keeps fighting! On the right Paladin Knights are charged in unison with Storm Wind cavalry. The damage is substantial but still not enough to impress the Knights. However, they are slowed down too and Elven reinforcements were on the way. Finally, the combined effort of all Elven units equipped with bows brought down Basilean Chariots creating a big hole in the enemy formation. 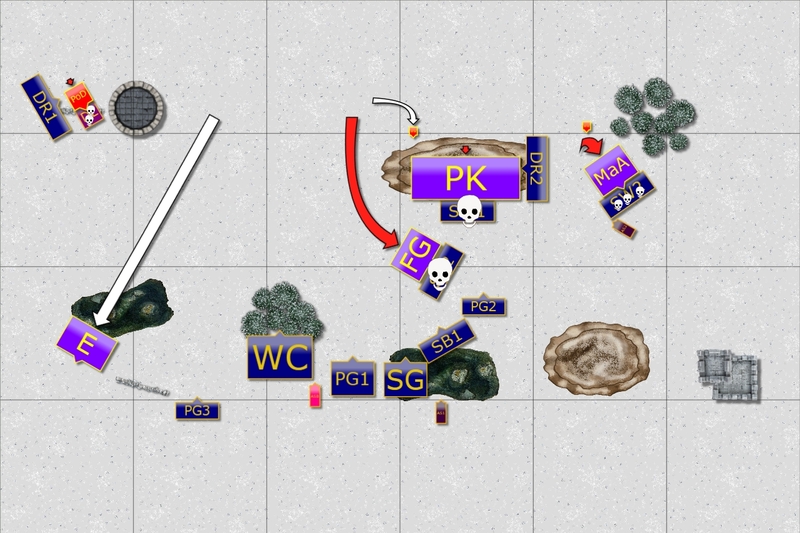 Elves start losing units too. Basileans counter attacked. First, the Knights eliminated enemy cavalry and reformed to face Drakon Riders. Then Foot Guard intercepted Elven fast cavalry who made a grievous mistake of getting too close and paid the ultimate price. High Paladin kept hitting back at the Drakon Lord but the Elven commander have not yielded yet. Finally, Elohi moved to the safe spot to fly around Elven flank and avoid Elven units. When Paladins, both mounted and on foot, committed to the melee they inevitably exposed flanks to numerous Elven units. Elven commanders waited for such opportunity and gave the signal to another wave of attacks. Palace Guard dealt killing blow to the Knights who were distracted by Drakon Riders. 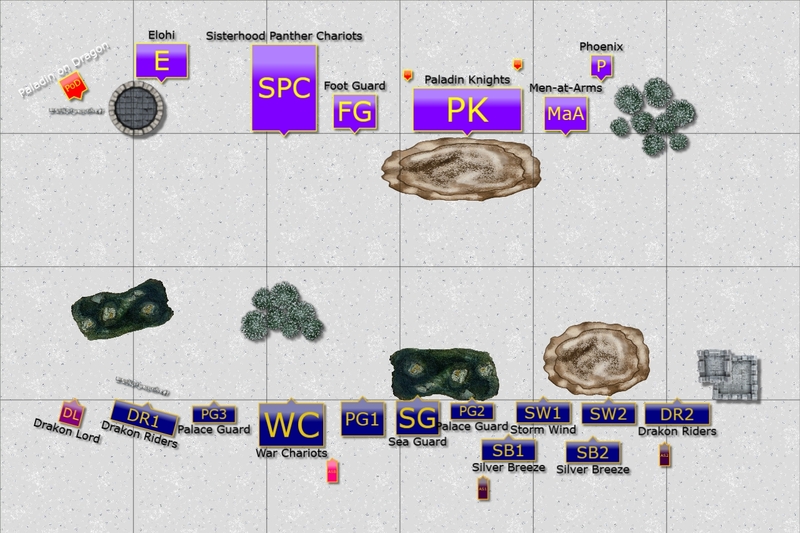 While Chariots and the regiment of Elven infantry defeated Paladin Foot Guard. Elohi dance around Elven units. 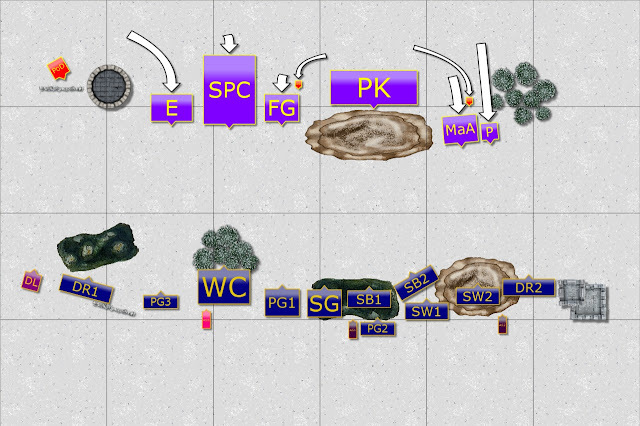 With main Basilean units gone the battle broke into separate melees. The High Paladin finally routed Elven Drakon Lord and faced Drakon Riders. Men-at-Arms also defeated their adversary and prepared to receive the inevitable charge of Drakon Riders. Elohi kept avoiding Elven units and flew around them while avoiding Elven arrows on the way. Drakon Riders kept attacking their foes but while on the right flank they managed to rout Men-at-Arms, then High Paladin on the left refused to yield! Wizards aim at Drakon Riders. With Elohi not engaging and High Paladin locked in mortal combat with Drakon Riders it was up to War Wizards to do damage to the enemy. Drakon Riders were burned but still alive. Elves were content with the objective security and consolidated their positions. Only Drakon Riders made last one attempt to defeat the High Paladin but could not! The Dragon lives! 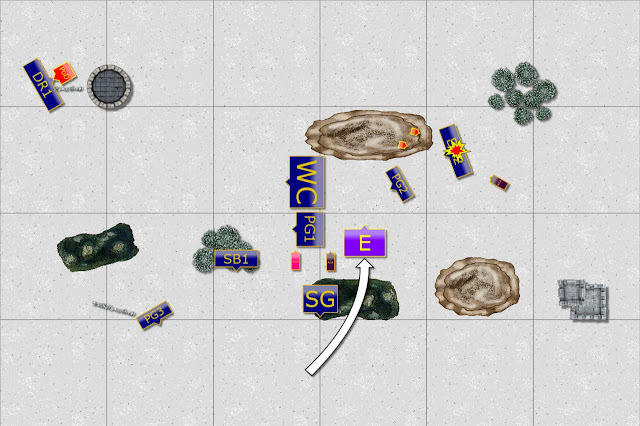 Elohi finally land in the middle of the battle field but it is not enough to shift Elves from their fortified positions. War Wizards managed to destroy Drakon Riders though. Since the strategic objective was achieved Elven commanders decided there is no need to continue senseless bloodshed and allowed their honorable foes to withdraw. Many thanks to Kate for a great game! I hope she will attend more events in the future and I am looking forward to the opportunity for a rematch! Before I move to some comments I wanted to add that in this game I barely managed to finish my turns in time. In fact, I skipped shooting and did not attack wizards as otherwise I would have timed out! I am glad I didn't but it seems I still need to work on my speed of playing. I am of course glad my plan worked and that I managed to destroy the chariots with shooting and that I got the chance to defeat the Knights. I noticed, however, that I didn't use the chance to approach them in a more aggressive way as it seems I considered hills as height 1! 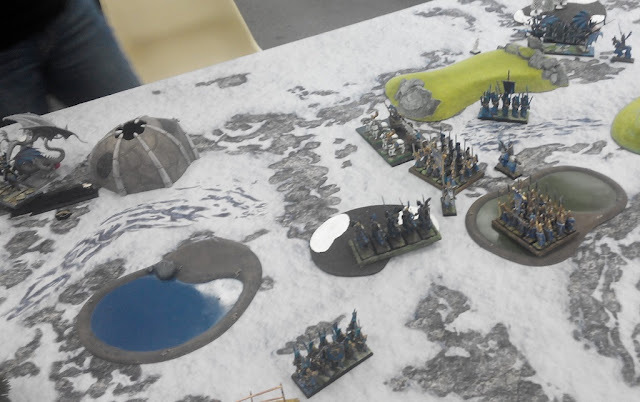 Only during writing the battle report it occurred to me that when they were behind the hill in turn 2 they could not see my approaching units with the exception of Drakon Riders. I also made a mistake with Storm Wind in getting too close to Foot Guard. While it allowed me to counter attack the Paladins in the following turn it is still a mistake when units are exposed like that without an intention of being a bait. We discussed the game with Kate and she told me she was shy to approach more aggressively as she was concerned her units will be swarmed. It definitely helped me to position my units and intercept her fast Dragon and Phoenix so that they would not be able to assist the units in the center. I am sure, however, that next time we play she will be more bold and I'd better be prepared for that! Great battle report as usual, I'm glad you came back from your recess, greetings from Argentina! Thanks a lot for your comment! I am happy to know you like the report and yes, good to be back! I follow your reports and articles from ulthuan.net, personally I think your reports are the best KOW battle reports out there! and answering your question, here we are a small group of forgotten children of WHFB... but it turns out that there is an interesting move of KOW but in Buenos Aires, 5 hours trip from where we are, but it is difficult to coordinate to travel to tournaments, again I am glad that you have resumed "the vice" as we call it here. cheers! Ha! Great to know that posting on Ulthuan helped to attract some attention :) And thanks a lot for your kind words! I am really happy to know you like the reports! It is great that you have some growing interest with KoW. I understand that attending tournament may be more difficult. However, looking at my local examples people also start with organizing things in the home town. It may be small, just a few players but it is a very good idea to do so in order to attract new players. It may not be even a "tournament" as some players may be a bit shy to attend if they don't have experience. Dedicated KoW evening or day in a local store or club usually does the trick. This reminds me simply of a game of Warhammer when you were first tapping into the whole MSU concept for High Elves. It caught people off guard that you'd often easily gain a victory simply because they didn't know what to expect, and had no experience against it. As painful as it is to watch/read, I'm sure Kate has learned a great deal from this game and going forward if she applies these lessons you've made her a better gamer for it. Indeed, that was the case too. Players who have not faced MSU type of the list before seem to a bit shy in their approach. I guess it is similar for any type of a list if you have to fight against it for the first time. Like you said, I do hope that Kate still liked the game despite the result and that she will keep practicing with her chosen army as it is the best way I know to get better and enjoy the hobby to the fullest. I didn't realize I am "everywhere" :) But I am glad that what I write is useful!